Kyle is a warrior. He knows how difficult consistent training can be. With the help of his best friend, he never wavered. Even on the toughest days, Kyle found a way to the gym! At the age of 17, I found out that my dad had polycystic kidney disease (PKD), a hereditary condition that involves cysts developing on the kidneys. Living with PKD requires an extremely low-salt, low-protein diet. Scared of getting PKD myself, I never added much protein to my diet. I didn't go to the doctor's office, either. I was afraid to hear my own test results. Shortly after I found out about my dad, I left for college. 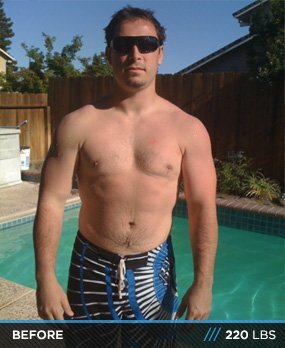 I went into college with the mindset that I didn't need to watch what I ate and could drink three nights a week and maintain the physique I had in high school by simply working out 3-4 times a week. As I went through college, I lived this lifestyle and continued to gain weight to the point where people would mock me for being fat. I knew I wasn't overtly obese, but I knew I wasn't the stud I used to be. I still never did anything about it. After I graduated college and my life slowed down a little, I started to take my fitness and eating habits a little bit more serious. It wasn't until February 14, 2012 when I visited the doctor to see if I had polycystic kidney disease and was assured I did not have the disease. After this, it seemed like a weight had been lifted off my shoulders and I wanted to work as hard as I could and look better than I did in high school. I immediately bought protein, a pre-workout, and casein to help me out; as well as took a trip to the grocery store. I worked out with my best friend later that night and pushed my body to its absolute limit. I think we were in the gym for about four hours just pushing each other. I told my roommates about the good news and they were ecstatic. My friend and I worked out every night for three hours and he dieted when he didn't need to. If it wasn't for him, I don't know if I would have been able to lose all the weight and get ripped! My life has changed drastically since that date. My best friend and I are closer than we ever have been before. It's so important to have that support system so you can vent about your frustrations, discuss new workouts, and discuss how amazing our cheat meal was going to be. I also receive compliments from other friends who have noticed how much weight I have lost. My confidence has gone through the roof and it feels like a lot more is possible if I just put my mind to it. I started working out when I was 16 years old in high school and played every sport imaginable. Sports taught me the importance of competitiveness, perseverance, and most of all, the value of hard work. In high school, I worked out mainly for girls because I knew I wasn't going anywhere in sports simply because my athletic ability wasn't good enough for college. Not to mention that my high school sports coaches would force us to workout with a formulated plan. A lot of my inspiration came from finding out I didn't have PKD when I was almost certain I had it for the past eight years of my life. I felt as though I had an epiphany or something. I did a complete 180 and changed almost everything I was doing in my life. Before, my life consisted of going to work, maybe working out, and having a beer with my friends, and sleeping. When I didn't feel like working out, my buddy would force me to go with him and vice versa. My mom was also there for me as well. I would call and tell her about the craziness I was doing at the gym and my complete change in diet. I would send her pictures on a monthly basis and she was 100 percent supportive of me. She's always been someone I could go to for anything and has always been a great support system for me. Between her and my buddy, it was only a matter of time until I was going to be in the best shape of my life. The aspect that challenged me the most was hitting a plateau. That is the most frustrating situation to be in. I worked so hard and started seeing results, then all the sudden I stopped. I would get so mad. I would take it out on my body and workout even harder than I was the previous day. I finally decided to educate myself instead of waste energy and decided to mix up the workout and try different programs, which was very difficult considering how stubborn I am. I then started seeing results little by little. Sometimes I have to remind myself to work smarter not harder, which is very difficult when it comes to training. I don't really have any future fitness plans besides staying on the same track that I'm currently on. The only thing I would consider would be a modeling career, but I think I would be WAY to shy in front of a camera. When random people see your results, they seem to criticize your workout and diet like they know everything. What works for you is what is important. Everyone is different and there is no single workout or nutrition regimen that works for the entire human race. The beauty of the gym and your hard work is that it shows. You don't need to talk about it, you don't need to take off your shirt, and you don't have to inform anybody of your hard work. I get so passionate about this because it is one of the simple beauties in life. I don't have to tell anyone about my transformation or hard work because they take one look at me and see that I work hard and I'm disciplined about it. I find it quite common with young adults who are trying to stay fit and have a career at the same time. Their coworkers offer them cake, doughnuts, or whatever they brought and you refuse and get scrutinized for it. Just remember that your coworkers are not working their butts off at the gym…you are! Some people like to workout alone, but I don't. My parents and roommates played a critical role in my transformation. Between my frustrations and wanting to go back to the old lifestyle, those people were the ones that gave me strength. One of my roommates played the biggest part in my success. I owe so much to my best friend and roommate; he has gone above and beyond the duties of just being a buddy. That support system is clutch for me. I needed him more than he will ever know. I have been friends with him since I was 17 and met him when I first arrived at college and didn't know anybody. I have been there for him when he was having problems and he was definitely there for me through thick and thin. When you find someone to help you go through a transformation like this, you begin to realize who and what is important in your life. Everyone is in your corner when things are going well, but when you're on the ground, depressed, feeling like you're weak and not worth anything, take a second and look around to find out who really cares about you. Besides my parents, there were only a handful of people who were there for me. Lastly, when you feel tired, don't want to work out, or frustrated because you're at a plateau, I would encourage everyone to read this article titled, "The Iron" by Henry Rollins. Your strongest muscles are your mind and heart. Keep those strong and you can do anything. 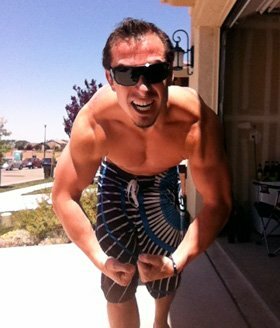 Bodybuilding.com was my savior. I read the articles for information and used the Transformations of the Week as motivation. There's a good chance I read every article that the website has to offer. It seemed like I spent hours a day just reading the articles. I would have to force myself not to slack off at work and go on Bodybuilding.com. I'm not saying that didn't happen, but I couldn't help myself. I also ordered all my supplements through Bodybuilding.com because they had the best prices and usually ate up my paycheck most weeks. The only time I went somewhere else to get my supplements was only if I needed something that day.